The slab of the avalanche was composed hard snow (1 Finger - Hand Hardness Index). The slide was triggered by a rider on a motorized snow bike, medium sized for what that path could produce, but large enough to injur or kill a person. It broke into old snow, releasing on an interface between two layers in the snowpack (HS-AV-R3D2-O). The avalanche released on a layer of buried surface hoar. This was a Persistent Slab avalanche. Three separate avalanches occurred during this accident. We are unable to determine the avalanche size, relative to the path, of the fatal avalanche. The R size listed includes all three avalanches. 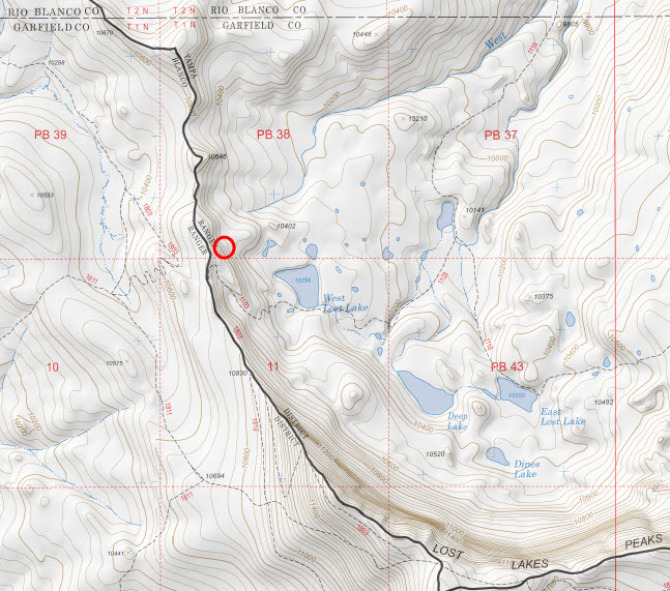 The closest weather station to the accident site is the Ripple Creek Snotel. This weather station collects snow and water as well as air temperature, hourly. 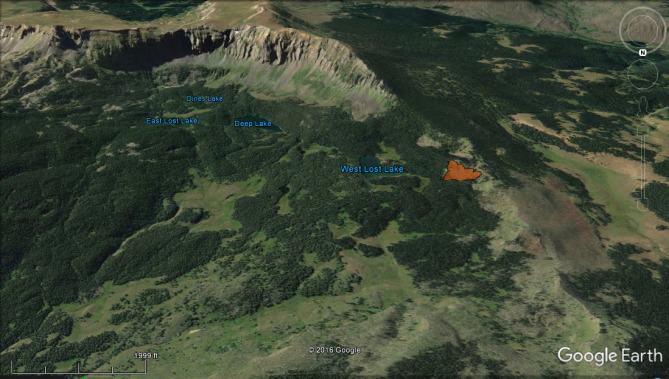 The Ripple Creek Snotel is approximately 3.5 miles to the northwest of the accident site at an elevation of 10,340 feet. High pressure, clear skies, warm daytime temperatures and calm winds dominated the weather the week of January 16th. From January 16th to the 19th, daytime high temperatures reached a few degrees above freezing and nighttime low temperatures were in the mid teens Fahrenheit. 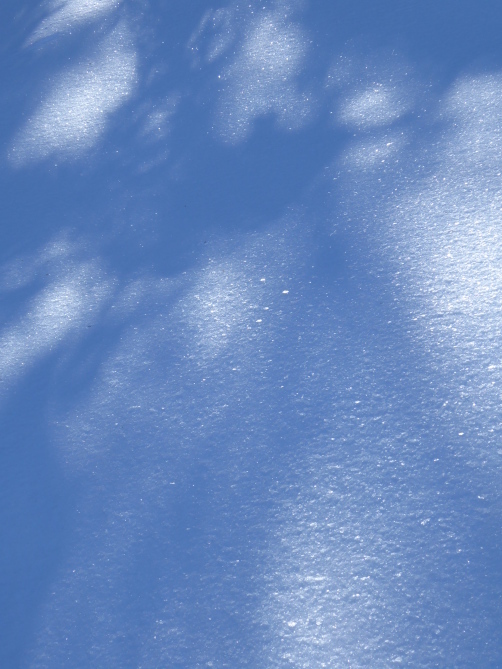 This period of high pressure resulted in the development of a layer of large-grained feathery surface hoar crystals at the snow surface. Just after midnight on January 20th, snow began to fall. 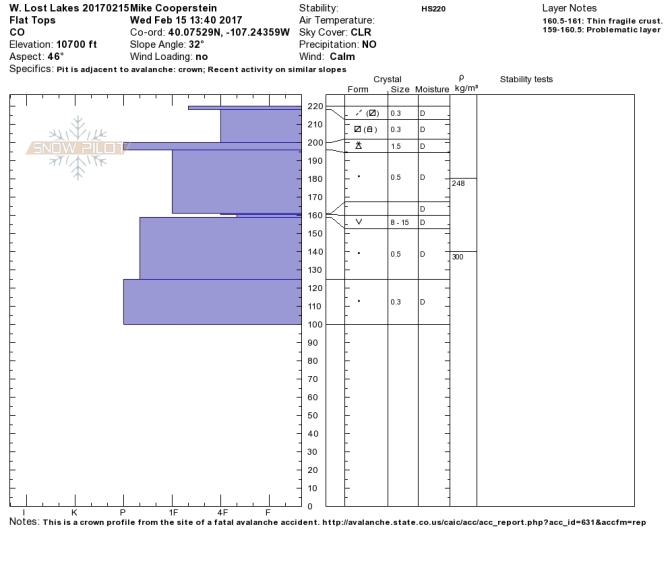 By 6:00 a.m. on January 21, the Ripple Creek Snotel recorded three inches of snow with 0.3 inches of snow water equivalent (SWE). Snow continued throughout the day on January 21 burying the surface hoar layer approximately six inches deep. Intermittent snow fell for the remainder of the month of January. During the first week of February, the Ripple Creek Snotel reported about a foot of new snow. On February 8th, another 7 inches of new snow was reported. 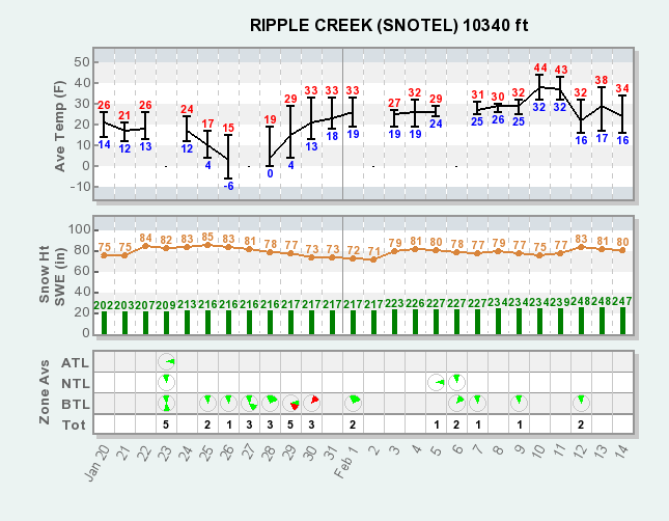 On February 11th, the Ripple Creek Snotel reported 1.3 inches of SWE with over 10 inches of new snow. On February 14th, the day of the accident, skies were clear and the temperature at 8:00 a.m. was 17 degrees Fahrenheit. At noon, the temperature had risen to around 30 degrees Fahrenheit. Temperatures warmed to just above freezing by 2:00 p.m. and skies remained clear. 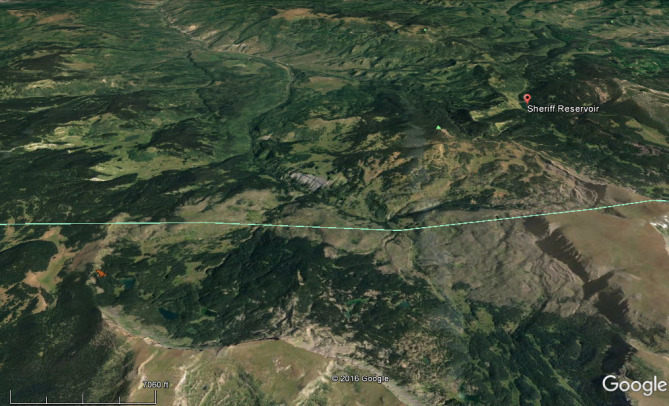 The total depth of the snowpack in the area of the accident ranged from about 150 cm to 190 cm. The weak layer the avalanche slid on was a layer of 5-12 mm surface hoar, 60 cm below the surface. It was sandwiched between two fairly hard layers of snow (1 Finger and Pencil on the Hand Hardness Index). We observed three snow profiles in the area, one in the crown of the avalanche. In all three profiles the surface hoar crystals were laying down, and difficult to see in the pit wall. In Extended Column Tests the crack propagated across the column on tap number 26 and 28. We had one test that did not produce a propagating crack. There was an old avalanche of similar depth, but smaller width, on the same ridgeline to the north of the accident site. The only other signs of instability we observed were rolling collapses as we crossed several flat areas on the ridgeline above the accident site. Riders 1 and 2 started the day at Sheriff Reservoir. The two had been riding together for many years and often recreate in the area to the west of the reservoir. On this day they were exploring new terrain and rode to the west of the reservoir and north of Pyramid Peak. They saw some old avalanches as they rode, but the slides were either small or old and they did not adjust their plans because of them. They stuck to open areas, frozen lakes and meadows, as they headed south towards the East Fork of the Williams Fork. Near the eventual accident site, Rider 1 got stuck near a stand of trees, and Rider 2 circled back to help. Then both riders headed up an opening in the trees towards a long terrain feature to the northwest of West Lost Lake. Rider 1 was leading and turned to the south. Rider 2 turned north through the trees. Rider 2 crossed the bottom of a small open slope below a north/south running ridgeline. He rode to the north looking at the slope and then turned back to the south, making a climbing switchback across the slope. About halfway across the slope on his climbing traverse he heard a loud sound and saw two cracks shooting across the slope. He looked uphill and saw the snow above him moving. He took his hand off of the handle bar to pull the trigger on his airbag. He heard a hiss, but his airbag did not fully inflate. The slide struck his bike and threw him from the machine. He landed in a seated position with his feet pointing downhill. Caught in the avalanche he went under the snow, but swam hard, using the back stroke and dolphin kicks, to get back on top of the moving debris. He was heading for a single dead tree and he reach out and hooked it with his right arm. This stopped his descent and the debris continued down the slope. He watched the slide knock over several large trees as it headed to the bottom of the slope, leaving him on the bed surface above the deeper debris. Rider 2 dug his legs out of the snow and looked around for Rider 1. He had not seen Rider 1 since they left the meadow below and was unsure if Rider 1 had circled back and followed him into the open slope. It was quiet and he yelled for Rider 1, but got no response. Rider 2 walked down the slope and on to the debris pile. He continued to look and yell for Rider 1, and then a second avalanche released on the north flank of the first slide. The slide released with a loud sound, breaking trees as it ran down the hill. Rider 2 took out his avalanche transceiver and turned it to receive. He walked around the debris pile, but did not pick up a signal. He got out his shovel and probe and used them to search. He spent just over a hour probing likely buried locations. 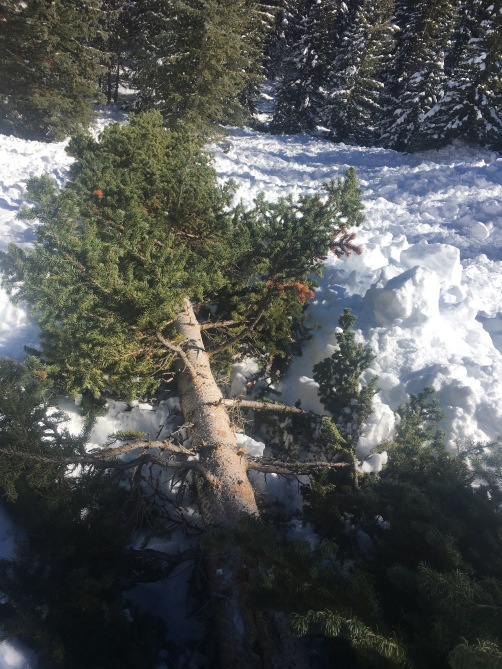 He struck objects three times and dug into the snow to investigate, but each time he found a tree, broken in the avalanche, buried in the debris. Rider 2 was worried about the length of time that Rider 1 was missing and decided he needed to get help. He hiked uphill and dug out his bike, which was buried with part of the ski sticking out. He rode towards the top of the slope, parking his bike just below the crown about 15 feet into the south flank of the avalanche. He walked up to the ridgeline and searched for a cell phone signal to send a message, but was unsuccessful. He walked downhill towards his bike, but it was no longer where he left it. A third avalanche released while he was out of sight, washing his bike downhill. Part of his bike was sticking out of the debris. He descended the slope on the bed surface and retrieved the machine. He rode back to the meadow below the slope, then north and up to a higher portion of the same north/south running ridgeline. There he got a weak cell phone signal and sent a text message with a rough location and asking for help. Rider 2 then traveled back to the accident site. He began probing down the south side of the first avalanche through the trees. This area was near the edge of the debris, away from the main pile, and in sparse trees. He got a probe strike and dug about 18” into the snow to find Rider 1’s helmet. He dug Rider 1 out of the snow and began CPR. He continued CPR for 20-30 minutes before stopping his resuscitation effort. Rider 2 waited at the accident site for about 2 hours and then decided to head to a high point he crossed earlier in the day where there was a good cell phone signal. He followed their tracks from the morning, but cut across some areas to avoid places where they played earlier in the day. He saw snowmobile tracks that he assumed were made by the search and rescue team. He followed them, but ran out of gas. His spare gas tank was ruptured in the third avalanche, so he set out on foot. He began hiking in the direction of the rescuers. He saw the helicopter and tried to flag it down, but was unsuccessful. He stomped out HELP in the snow with an arrow in the direction he was traveling and started to hike out. The helicopter eventually found him and transported him back to Sheriff Reservoir. Riders 1 and 2 regularly ride from Sheriff Reservoir. They frequently spent time in more consequential terrain and were exploring a new area on the day of the accident. The slope that avalanched was not the group's objective, just an area that they were passing through. This accident involved only two people, but it was a fairly complicated series of events. There were three avalanches and two separate companion rescue efforts before the organized rescue arrived. Every avalanche accident is traumatic for the people involved, but Rider 2 had an especially difficult experience. He was caught in an avalanche and unsure if his partner was involved. He made several efforts to find his friend and to try to get help. He made an unsuccessful resuscitation effort, followed by a prolonged extrication from the field. Any discussion of this accident should begin by acknowledging these factors. Unfortunately the lessons we can all learn from this accident are not unique to this event. Patterns of avalanche activity - The surface hoar layer that produced this avalanche formed in late January. 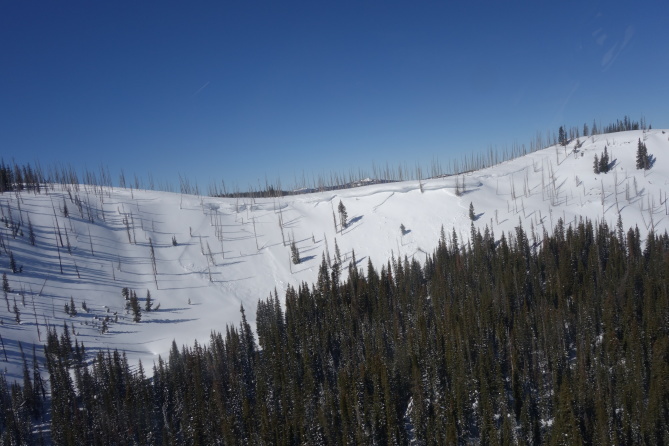 It caused both natural and human triggered avalanches in the Steamboat and Flat Tops zone from January to the middle of February. 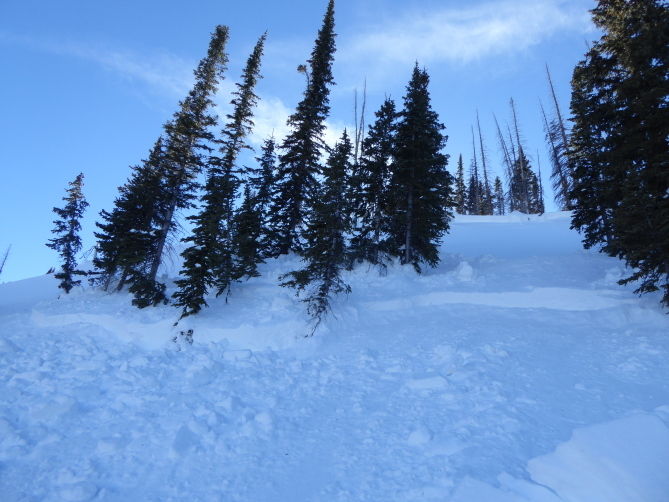 Observers described a fairly sensitive weak layer that produced avalanches on northwest, north, northeast, east, and southeast slopes, near or below treeline. Most of the reports came from the east side of the zone with few reports from the Flat Tops. Investigators saw a recent, but not fresh avalanche on a similar terrain feature to the one where the accident occurred. 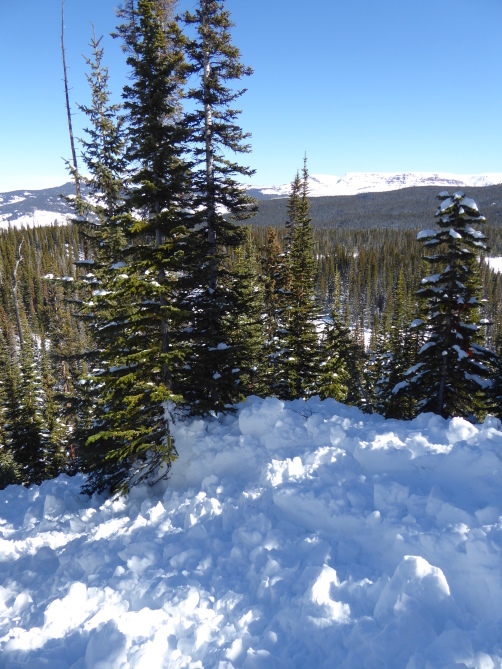 Although recent avalanches are the best sign of unstable snow, it is a little more complicated with a surface hoar layer that produces avalanches for weeks or months after being buried. 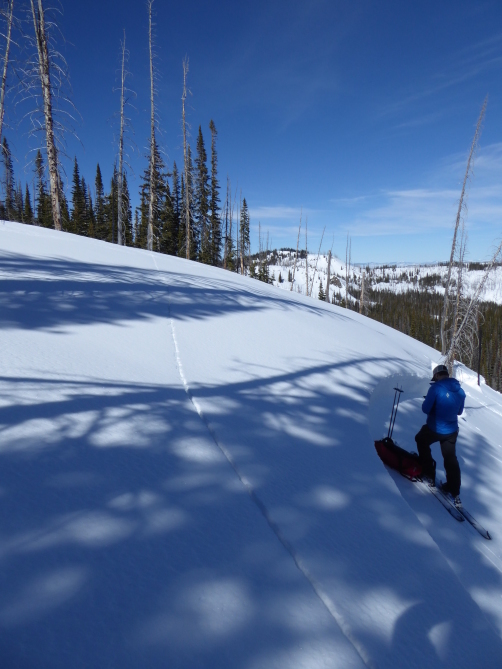 Knowing the history of the snowpack from observations or from a public forecast product could have helped this group connect their observations to the current avalanche conditions. Avalanche transceiver - The group knew about avalanches and was carrying rescue equipment. Riders 1 and 2 had shovels, probes, and airbag packs. In our investigation, we could not find evidence that Rider 1 was carrying an avalanche transceiver (rescue beacon). Rider 2 had an avalanche transceiver and used it to search the debris shortly after the avalanche. Given the depth that Rider 1 was buried, that he was wearing a full-face helmet, and was under relatively soft snow, there is a chance that wearing a transmitting transceiver would have led to a better outcome. Using avalanche transceivers increases the chance of a successful rescue, but it does not guarantee a live recovery. The few studies that examine transceiver rescues of fully buried avalanche victims found just over 50% result in a live recovery (Atkins 1998, Tschirky et al., 2000). Avalanche airbags - The use of airbag packs has increased dramatically over the last few years. Recent articles by Haegeli and others (2014, The Avalanche Review, Resuscitation) estimate airbags could reduce about half of the avalanche deaths in North America. They also cite a 20% failure of the bags to deploy, with 60% of these due to the operator. In this accident both Riders 1 and 2 had airbag packs, were caught in an avalanche, and their airbags did not deploy. Rider 1 did not pull the trigger on his pack (to the point it would deploy). Rider 2 pulled the trigger, but the bag did not fully inflate. The events of this accident reinforce three points often discussed in avalanche safety courses: 1) you should practice with your safety equipment so you can use it in an awkward and stressful situation, 2) you should regularly test and maintain your rescue equipment so it works in an emergency, and 3) all rescue systems have a failure rate so use more than one (i.e. airbag and transceiver). 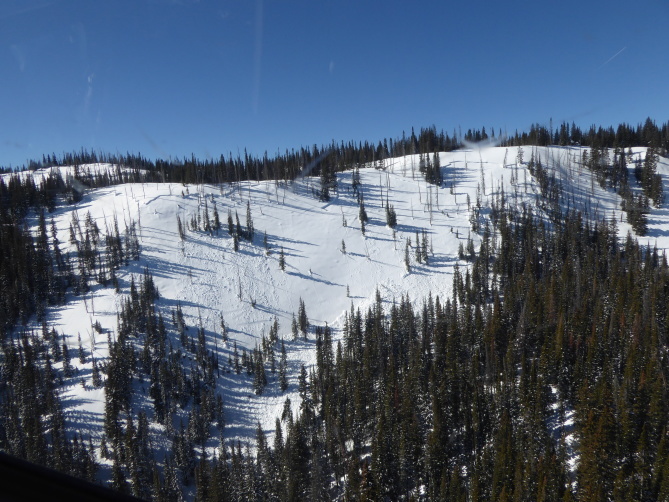 This is the second fatal avalanche accident involving a motorized snow bike in Colorado in the last two years, third in the U.S. (February 25, 2012 in northern Montana). Whenever people find a new way, or improve an existing way, to get into avalanche terrain we see an increase in avalanche accidents. Snow bikes are not new, but there are more people using them and improving the performance of these machines. The avalanches in the two accidents we investigated were both triggered as the biker traversed a 30 to 40 degree slope (33 degrees in this accident and 36 degrees in the 2016 accident). Snow bike riders approach terrain differently than snowmobile riders. How we use the terrain to travel has implications on how and where we trigger avalanches. We would like to thank the search and rescue groups of Routt and Garfield counties, the Garfield County Coroner's Office, and Classic Air Medical for their response to this accident and help in compiling this report. Date/Time of Incident: February 14, 201712:45 p.m.
On February 14, 2017 at approximately 12:15 hours, Rio Blanco County Communications Center received a report from Routt County Communications of an avalanche that occurred near Sheriff’s Reservoir in Rio Blanco County. Routt County Search and Rescue responded to the area. Classic Air Medical was also contacted. Classic Air Medical flew the area after receiving information from reporting parties in the area. 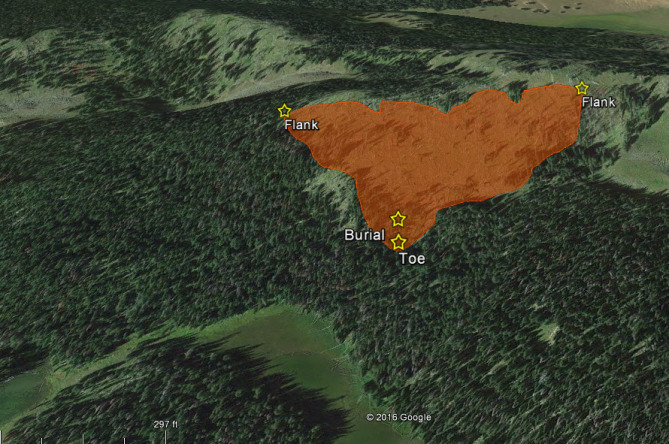 Classic was able to find the avalanche area and it was determined to be in Garfield County. Garfield County was contacted. In the area of the avalanche, rescuers located a male deceased. Classic and Routt County further searched the area and located the other party who was tired and not injured. At this time 5:35 p.m. Classic is assisting rescuers off the mountain and plans are in the works to recover the deceased party tomorrow morning. This has been a multi-agency operation between Rio Blanco, Routt and Garfield counties. Another press release will be issued tomorrow after all agencies can get together and provide you with all the facts. Figure 13: A snow profile from the crown line of the avalanche.